NASA has successfully applied a new technology in flight that allows aircraft to fold their wings to different angles while in the air. The recent flight series, which took place at NASA’s Armstrong Flight Research Center in California, was part of the Spanwise Adaptive Wing project, or SAW. This project aims to validate the use of a cutting-edge, lightweight material to be able to fold the outer portions of aircraft wings and their control surfaces to optimal angles in flight. SAW, which is a joint effort between Armstrong, NASA’s Glenn Research Center in Cleveland, or GRC, Langley Research Center in Virginia, Boeing Research & Technology in St. Louis and Seattle, and Area-I Inc. in Kennesaw, Georgia, may produce multiple in-flight benefits to aircraft in the future, both subsonic and supersonic. Folding wings in flight is an innovation that had been studied using aircraft in the past, including the North American XB-70 Valkyrie in the 1960s. However, the ability to fold wings in flight has always been dependent on heavy and bulky conventional motors and hydraulic systems, which can be cumbersome to the aircraft. The SAW project intends to obtain a wide spectrum of aerodynamic benefits in flight by folding wings through the use of an innovative, lightweight material called shape memory alloy. This material is built into to an actuator on the aircraft, which plays a vital role for moving parts on the airplane, where it has the ability to fold the outer portion of an aircraft’s wings in flight without the strain of a heavy hydraulic system. Systems with this new technology may weigh up to 80 percent less than traditional systems. The recent series of flight tests at Armstrong successfully demonstrated the material’s application and use, by folding the wings between zero and 70 degrees up and down in flight. On subsonic aircraft, such as commercial airliners, the potential aerodynamic benefit of folding the wings includes increased controllability, which may result in a reduced dependency on heavier parts of the aircraft, including the tail rudder. This may result in a more fuel-efficient aircraft, as well as the ability for future long-winged aircraft to taxi in airports. Additionally, pilots may take advantage of a number of different flight conditions, such as wind gusts, by folding their wings to adapt to any particular condition experienced in flight. One of the most significant potential benefits of folding wings in flight, however, is with supersonic flight, or flying faster than the speed of sound. The shape memory alloy is triggered by temperature, and works by using thermal memory in a tube to move and function as an actuator. Upon being heated, the alloy would activate a twisting motion in the tubes, which ultimately moves the wing’s outer portion up or down. NASA Glenn, which developed the initial alloy material, worked closely with Boeing to be able to use the alloy with an actuator in flight. To test the technology, NASA turned to Area-I to operate a remotely-controlled flight testbed called Prototype Technology-Evaluation Research Aircraft, or PTERA. PTERA was designed and built by Area-I, which was also involved in the design and integration of a shape memory alloy-actuated, wing-folding mechanism for the aircraft. The small-scale UAV features extensive flight instrumentation that is ideal for gathering data on SAW, as well as the ability to accommodate newly-designed wings for testing. Area-I personnel also conducted flight operations for the test, allowing NASA and Boeing to focus on the research during the flights. Including a pair of system safety check flights, the SAW test flights were conducted over a two-day period. 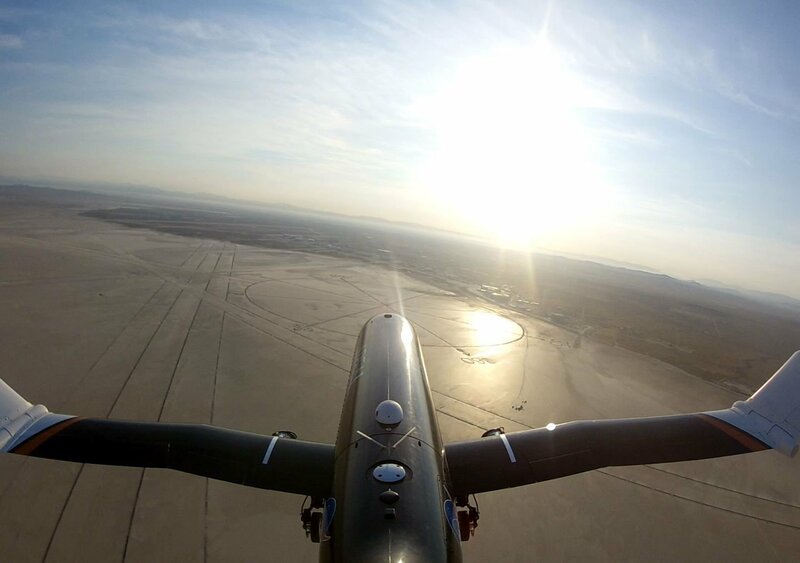 PTERA took off from the Rogers Dry Lake at Edwards Air Force Base with its wings at a level, zero-degree deflection. The testbed was flown in a large “racetrack” pattern, providing long legs of flight in which the necessary maneuvers for the research could be done. During these maneuvers, onboard controllers heated and cooled the SAW actuators, folding the wing panels to different angles between zero and 70 degrees. For the first two flights, the wing tips were rigged to fold downward, while later flights featured rearranging the hardware to achieve 70-degree upward deflection. Wing-folding maneuvers were achieved in flight within three minutes each. Follow-on SAW flights are planned for as early as summer 2018 that will expand the functionality of the SAW system, to be able to fold wings 70 degrees both up and down in a single flight. Tests are also expected to take place at Glenn, where engineers are working to scale up the technology flown on PTERA to be used on the wing of an F-18.